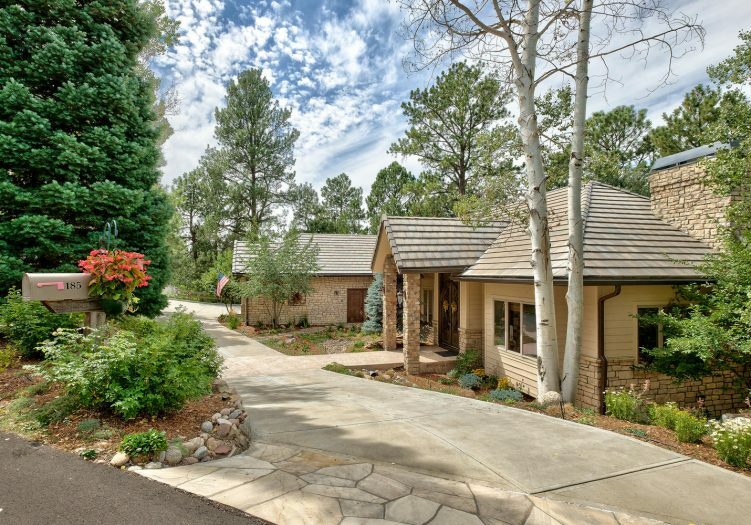 Enjoy elegant vacation style living in this finely appointed Castle Pines Village home nestled in trees on the 11th Fairway of the golf course. Walls of windows, and doors magnify the natural beauty of the setting. Delight in indoor/outdoor entertaining in the beamed ceiling Great Room, with fireplace opening to Dining, Kitchen and the spacious Deck with BBQ, granite bar and seating. Gather around the huge slab granite island in the gourmet kitchen with Sub Zero & Wolf appliances, wine refrigerator and custom alder cabinets. Handsome main level Study accented by finely crafted millwork and fireplace. The vaulted main floor master suite embraces nature with a wall of windows opening to the deck. Heated floors warm the resort style master bath. The walk-out lower level features a spacious recreation room with full bar, media center, gas fireplace, patio and focal point 400ct wine cellar. There are two additional bedrooms with en-suite baths, a powder room and plenty of storage.